Henry SCUDDER (1558 – 1595 ) was Alex’s 10th Great Grandfather; one of 2,048 in this generation of the Miller line. Henry Scudder was born in 1558 in Groton, Suffolk, England. Groton, Massachusetts is named after the village, as it was founded by a member of the Winthrop family; John Winthrop was born at Groton Manor in 1587. Henry’s parents were John SCUDDER (1539 – 1584) and Margaret LOWERS (1539 – 1641). He married Elizabeth HALE in 1584 in Kent, England. After Elizabeth died, he married Sarah Figg 10 Oct 1594 in Groton, Suffolk, England. Henry died in 1595 in Horton Kirby, Kent, England. Elizabeth Hale was born in 1565 and died in 1588. 1613 in Maldon, Essex, England 1625 in Strood, Kent, England and did not immigrate. Henry Scudder of Horton Kirby was a yeoman and carpenter. On the same page as his mother’s will, is his own: His will mentions his daughters, Alice, Martha, and Jane; and his sons, Henry, Thomas, and John Scudder, the youngest. His brother is shown as William Scudder. His wife as Elizabeth. Henry’s father John SCUDDER was born in 1539, and died sometime before October 18, 1584, in Kent County, England. John’s wife was Margaret [__?__]. She is deeded property at Sutton at Hone and Horton Kirby to her son, Henry Scudder, a carpenter, in her will, and her will was signed by William Scudder in 1585 (Fiske, 291). According to his will, which he signed 29 Sep 1594, Henry was a Kentish yeoman. This means that he was an independent farmer and landowner. Based on his landholdings, he must have been quite affluent. He identified his wife, Elizabeth, three sons and five daughters. One of the daughters, Jane, may have died between the date of the signing of the will and 5 Nov 1595 when the will was probated, as her name was scratched out at the time of the will’s proving. His will identified his landholdings as being within the parishes of Horton Kirby and Sutton-at-Hone. He left to his son, the Reverend Henry, “the mansion house where I now dwell,” apparently in Horton Kirby and quite extensive in its lands, houses, and edifices. He also left Henry a house in the Chalkdale. To his son Thomas, Henry left three houses in Chappell Greene in Horton parish. One house was rented by an unidentified Timothy Skudder, another by Michael Pickwell with an acre of land, and the third rented by Christopher Harris. He left the tenement and lands “purchased of Francis Reeve,” rented by Thomas Adams to his son, John. Henry provided that his wife, Elizabeth, would retain custody of all the properties until the boys reached the age of 18 years, provided that she brought them up decently and orderly. But if she were to die before the boys became 18, the properties would be in the custody of John Humfrey, the elder, Henry’s brother, William Skudder, and Anthony Comfot [sp]. By comparing the will of the Rev. Henry Scudder of Collingborne-Ducis with this will of Henry Scudder, the similarities of the properties distributed by both wills provides ample evidence that this Henry was the father of Reverend Henry and Thomas of Salem. Henry’s second wife Joyce [__?__] was born about 1590 . She first married [__?__] Savage/ Joyce died in 1651. Henry graduated from Christ’s College, Cambridge, in 1606. He began a life as a Puritan minister. He first served as vicar at Drayton, Oxfordshire. 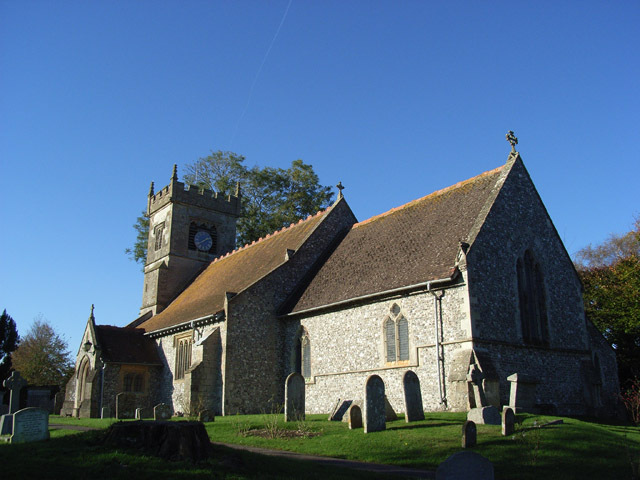 Then in 1633 he became the rector of St. Andrew parish at Collingbourne-Ducis, a village on the River Bourne, near Marlborough, Wiltshire, where he served the remainder of his life. During this time, he wrote a number of devotional works, one of which, “The Christian’s Daily Walke in Holy Securitie and Peace,” was used by churchgoers for close to 200 years. In June 1643, Henry was summoned to the Westminster assembly of divines. The following year in October, he preached before the House of Commons on a fast day at St. Margaret’s Westminster. His sermon was printed by request of the Commons. When in June 1645 an order came from the Commons to pray for Oliver Cromwell’s forces, Henry was one of the four preachers assigned to Aldgate. On 9 February 1648, his name was added to the committee for the scriptures. Henry died before the Restoration and was buried in his church at Collingbourne-Ducis. Later, his tomb was removed. His will, written 12 February 1651 and proved in London 31 May 1652, named his second wife Joyce; daughters Jane, Martha, Bridgett, and a deceased daughter, Elizabeth; a granddaughter, Elizabeth; and a brother, “Thomas Scudder, and all his sonnes and his daughter Elizabeth now in New England.” The will also named “cousins Bridgett Giles and John Scudder and Elizabeth now in New England. The Rev. Henry Scudder is listed in the Dictionary of National Biography. He was granted an MA at Christ’s College, Cambridge in 1606. Then he became Minister at Drayton, Oxfordshire. He married Elizabeth Hunt 7 Jun 1608 at banbury, Oxfordshire; she was the daughter of George Hunt longtime Rector of Collingbourne Ducis whose father, John Hunt, had been sentenced to be burnt at the stake under Queen Mary but narrowly escaped in 1558 with the accession of Elizabeth I. Her sister, Martha Hunt married the Rev. William Whately, the “Roaring Boy of Banbury.” In 1633 Scudder was presented by the King to the living of Collingbourne Ducis, near Marlborough, Wiltshire. 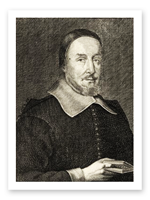 He held Presbyterian views and in June 1643 was summoned to Westminster Assembly of Divines where he preseided by order of the King over meetings attempting to unite the Church of England and the Church of Scotland. When in June 1645 on an order from the House of Commons to pray for the forces, Henry was one of the four preachers assigned to Aldgate. On 6 Apr 1647, he ‘made report of the review of the proofs of the Confession of Faith of the 7 first chapters and part of the eighth.’ On 9 Feb 1648 his name was added to the Committee for the Scriptures. He preached a sermon on 30 Oct 1644 at St. Margaret’s, Westminster, entitled “God’s warning to England by the Voice of HIs Rod” saying: “be enemies never so powerful and malicious, we need not fear them, it shall not be as they intend, either for the greatness or continuance of the evil which they would bring upon us; but according tot he will of God, who has givne them charge to afflict us… I have only this main suit unto you, that you would continue resolute for God and his true religion, for the King’s Majesties just rights, for the laws of the Kingdom and the liberties to which we are all born.” He dilivered this sermon to the House of Commons. It was printed at their request. His other popular writings: “The Christians Daily walk in Holy security and peace” (1627), a devotional work used among Protestants in the US. The 6th edition was issued in 1635, the 15th in 1813 and the last edition in 1826. A German translation appeared in 1636. His will dated 12 Feb 1651, probated 31 may 1652 reads, “I give to my brother Thomas Scudder, and to all his sons and daughter, Elizabeth, now in New England, twenty shillings a peice.” and “I give to my cousin, Bridgett Giles and my cousins, John Scudder and Elizabeth Lathrop, now in New England 20 shillings a piece.” He was buried in the Church at Colingbourne Ducis; his body ws removed after the Restoration. Many genealogies say that Thomas’ daughter Elizabeth married Samuel LATHROP, but our actual ancestor was her cousin Elizabeth. This entry was posted in 12th Generation, Artistic Representation, College Graduate, Immigrant Coat of Arms, Line - Miller and tagged Immigrant Widow. Bookmark the permalink. It states: Elizabeth Hale was born in 1565 and died in 1588. Her death year must be an error because several of her children were born (according to your list) after 1588.